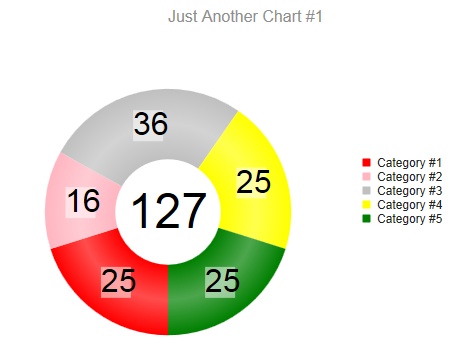 I have an application that I need to place the total of the values in the center hole of a donut chart. For instance, if I had 5 series values of 1, 2, 3, 4 and 5 then the hole in the center of the donut would contain 15. Of course, I would need to be able to control the font and format of the number. Is this possible using igDoughnutChart? Can you please clarify which control and which platform you are working on? In your post you reference the igDoughnitChart which is a jQuery/Html control. However you posted to the WinForms > Chart forms. Which are you using? Yes It is related to jquery/html control. After investigating this and doing some research, having a custom label/marker in the center of the igDoughnutChart displaying the total has been determined to be a product idea. You can suggest new product ideas for future versions by emailing ideas@infragistics.com. Include a link to this thread in your idea so product management will be able to look back at this case. I have tried to send idea on ideas@infragistics.com but it seems I amnot added in the group. Could you please help me on this? Thank you for the update. It appears a setting was set improperly on the email, that has been changed and you should be able to send the email now.